Do you need some inspiration for ways to decorate your home? 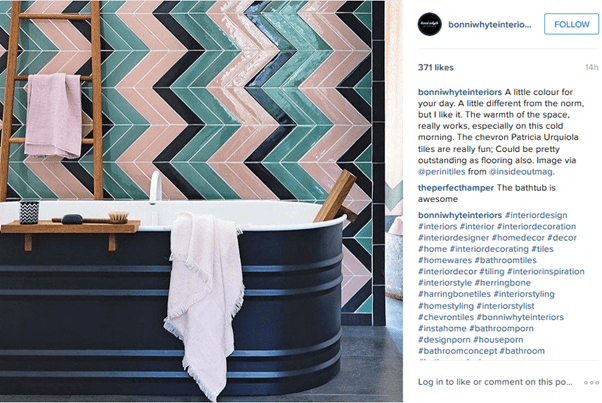 Whether you’re buying a new home or renovating, you can get hours of inspiration and ideas from interior designers on Instagram. 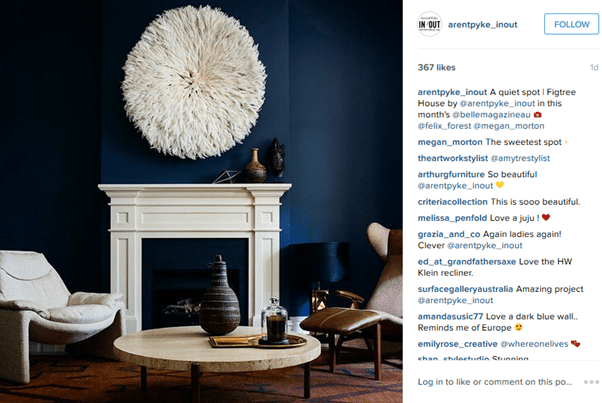 Follow these 50 interior accounts, and you’ll be inspired with a wealth of ideas about colour, texture, art and styling. Alessandra Branca invites you into her visual world filled with rich colour, ornate detailing and European architecture. Pinks, reds and purples are fused together to create vibrant yet elegant living rooms in traditional style. You’ll also come across photos of flowers, leafy greens, and beautiful sceneries with a view of the ocean. Angela Kounnas’ AMK Inspiration shows her love for beautiful and majestic interior spaces, minimalist style and contemporary homes. A world of colours, patterns, shapes, art and architecture abound. You’ll also find images of flowers, plants and candles that make great décor and accent pieces in a home. 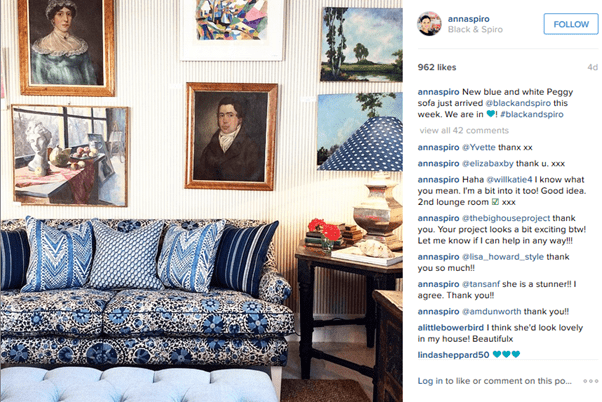 Anna Spiro’s Instagram account is filled with a variety of colours, patterns, textures and flowers that are combined together to create a unique and personal interior. Along with the vintage pieces and wall art or pictures, it’s also perfect for those who love cottage-style homes. You’ll also see images of old but magnificent architecture from her travels. 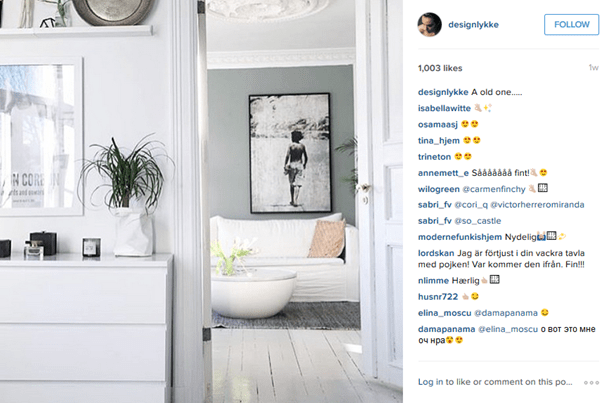 In/Out by Arent & Pyke offers a blog-style account on their current interior design projects, as well as images of the work of others that inspire them. The interiors are bright, modern and chic, with glass separators and pastel-coloured furniture. There are also pictures of individual furniture and lighting pieces of various colours, styles and shapes. 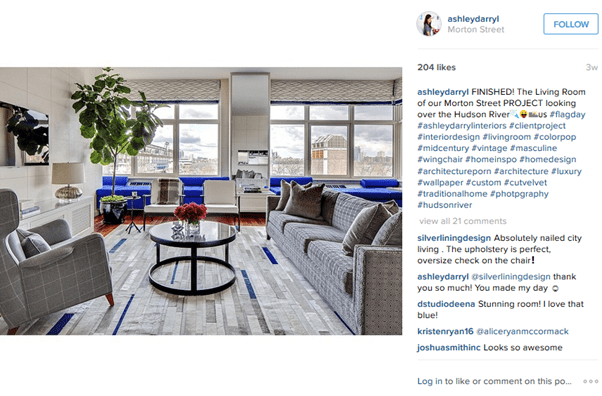 Ashley Darryl’s Instagram account shows her love for mid-century modern furnishings and pops of bold colours amidst monochrome, for added contrast and character-building. You’ll also come across images of amazing architecture, flowers, food, nature, fabrics, textures, and eye-catching patterns. Ashley Hicks captures beautiful pink flowers and lush green plants, as well as traditional-style homes with vintage interior designs. You’ll also find images of birds and bees, old paintings, relics, costumes and dolls, and east-Asian fabrics. If you love flora, fauna, art or history and want to incorporate these aspects into your home design, then this is the place to go. 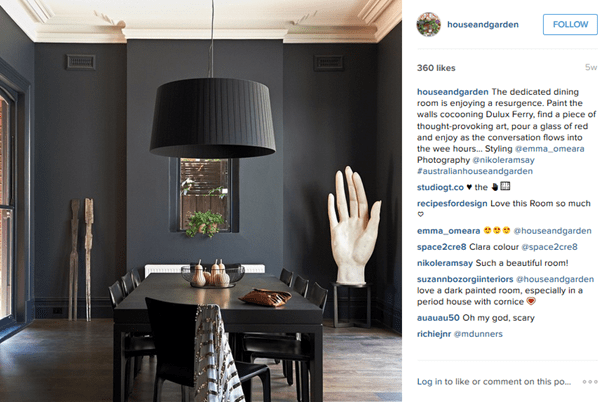 Australian House & Gardens has been the main source of home design ideas and advice for many generations, with pictures of charming décor and enviable outdoor spaces. A mix of the old and the new abound, with traditional and modern interiors that will suit any taste. 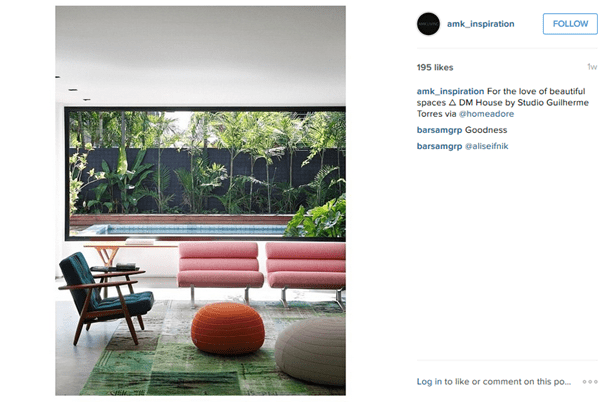 Other images include various shapes, patterns, furniture pieces and architecture to inspire you. 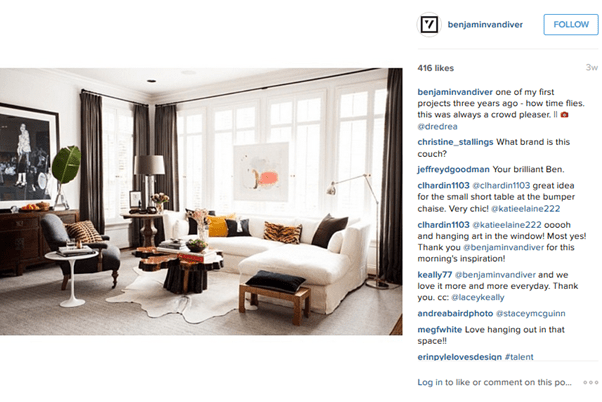 Benjamin Vandiver’s interior design style is all about minimalist design and modern living, with clean lines or shapes and contemporary looks. Rooms have soft pastel colours, such as browns, greens and creams, bringing a natural feel. He also posts black-and-white pictures of classic and timeless restaurants and buildings. 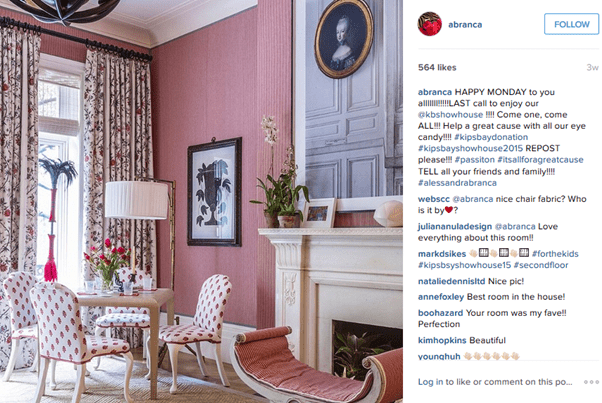 With Bri Emery’s Design Love Fest, you can clearly see that she has a love for the colour pink and knows how to use it well in interior design. 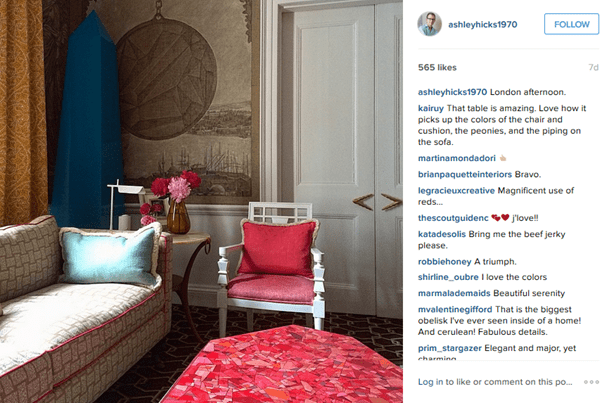 Her Instagram feed has pics of colourful furniture pieces, food, flowers, clothes, architecture, and the great outdoors with hints of pink. 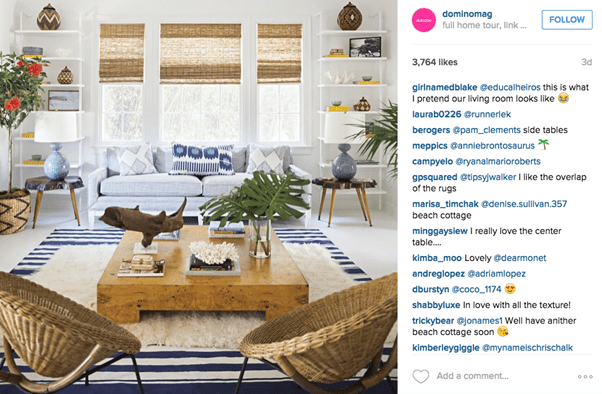 With Domino Mag, you’ll find homes where nature is brought indoors in browns, greens and blues amidst a white backdrop. The interior style is also a combination of the old and the new, with wood and dark/light standout furniture pieces being prominent features. Images of food, flowers and the outdoors also abound. 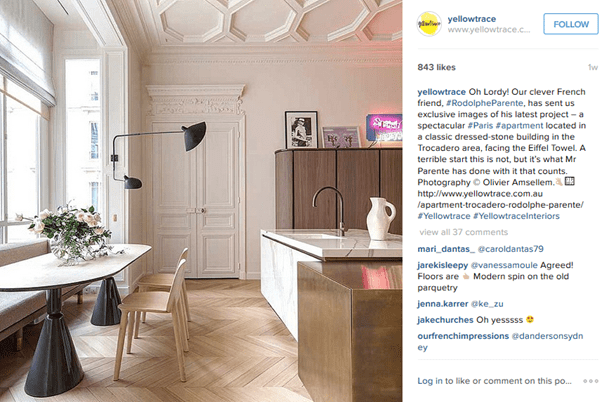 Dana Tomic Hughes’ YellowTrace can help you reach your full potential as a home designer. 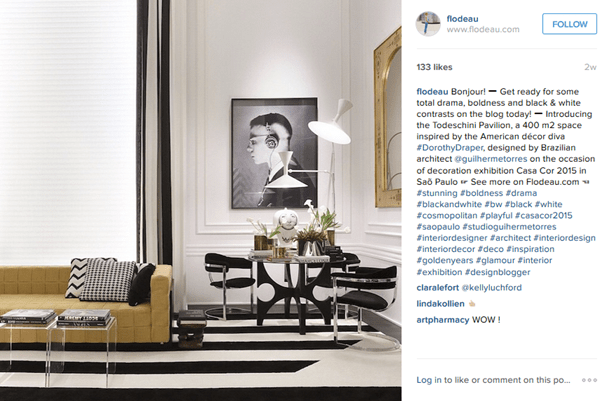 You can gather a lot of inspiration from here, from art, design and architecture to furniture, décor and interiors. Various colours, patterns and shapes can also be found here that can get your creative juices flowing and help you to create your dream home. 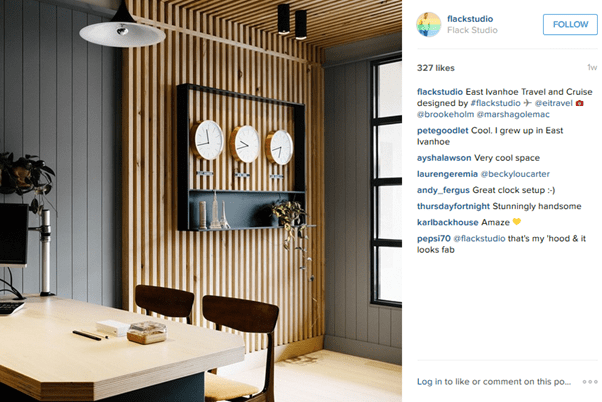 David Flack’s Flack Studio is about stylish and impressive interiors, with plenty of space and light that offer both comfort and warmth. Wood is a prominent feature in the designs, with a muted palette and pops of colour. 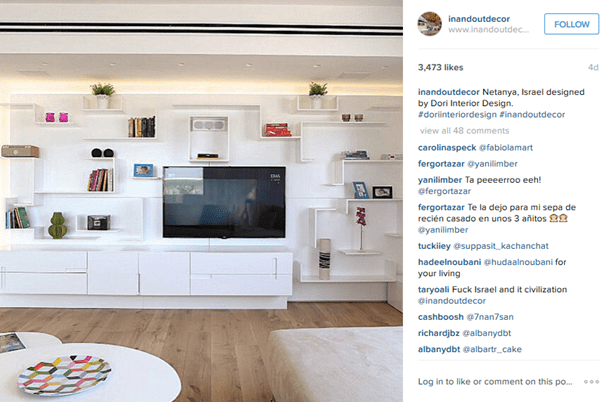 He also posts images of unique-shaped objects, lighting, furniture pieces and architecture that you could use in your design, to differentiate your home from the rest. Eddie Ross’s design style incorporates beautiful vintage and antique pieces found at flea markets and shops. 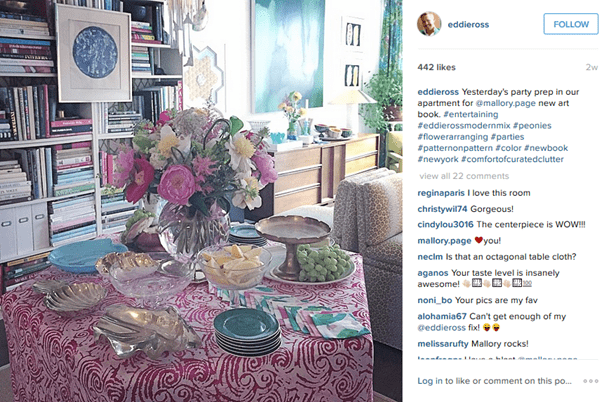 Bright pink flowers are central pieces in rooms. 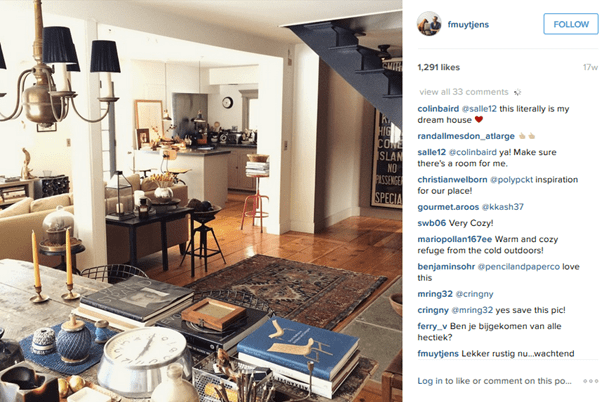 His Instagram feed also includes personal photos, some old that blend in with his classic design style, as well as views of the outdoors. If you love old homes, this one is for you. 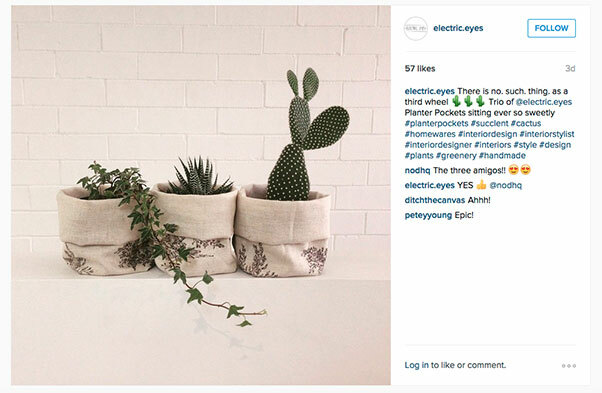 Electric Eyes provides great inspiration for adding some character to your home. Clean, white walls and furniture pieces with a dash of brown wood make rooms feel lighter, brighter and airier. You’ll also be presented with images of bright flowers, funky planters and ornaments, and immaculately styled rooms. Plus, if you see something you like on here, it’s very likely you’ll be able to purchase it from Electric Eyes, to bring some of their style into your very own home. 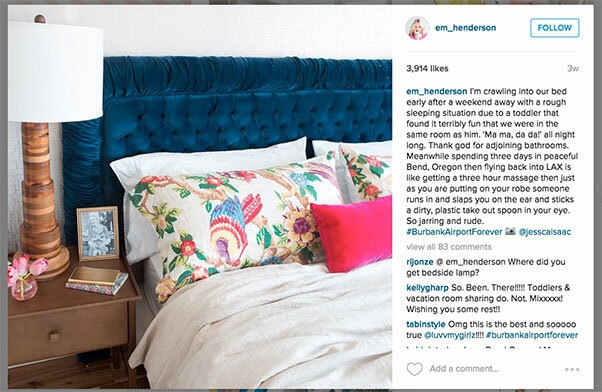 Emily Henderson’s Instagram feed doesn’t only have amazing colour, bright paint swatches and vintage accents, it also has DIY projects showing many ways to use the same item. She works mainly with the colour blue in her interior designs with wooden furniture pieces and floors, but she also adds touches of pink for a more feminine-looking room. 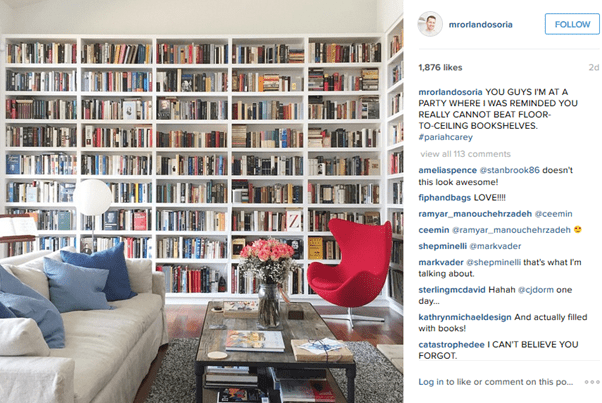 Florence Deau’s Instagram showcases dramatic and bold interiors with colour contrasts for a standout room. You’ll also find photos of blue skies and waters, beautiful architecture, food, rounded furniture pieces, and various floor patterns. If you love variety and want to try something different from the norm, this one is a must-follow. 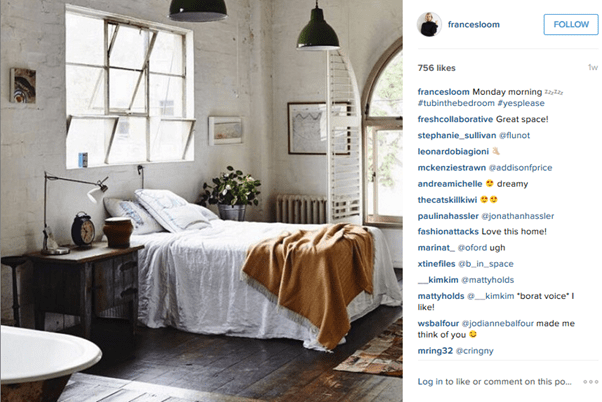 Frank Muytjens shares pictures of his weekend cottage with a mix and match of aesthetics for a cosy and masculine look. He also posts images of breathtaking sceneries showing the beauty of nature. If you want to bring nature into your home or hope to design a country home, Frank can give you plenty of inspiration. Grace Bonney’s DesignSponge is homely, while also being fun, colourful, and crafty. Colours range from bold blues, blacks and reds to pastel pinks, oranges and whites. You also get to see custom-made floor designs with various shapes, colours and patterns. Rooms have wooden furniture, giving them a traditional appearance. Photos of flowers and food are a great bonus for the homemaker. 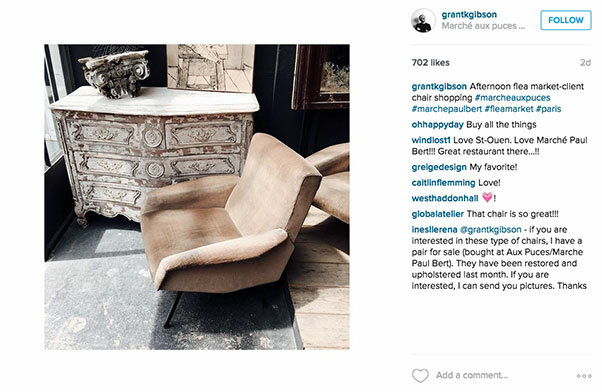 Grant K. Gibson’s Instagram pics all have white, square borders, which creates the illusion that you’re looking through a window into his world of beautiful interiors and architecture. 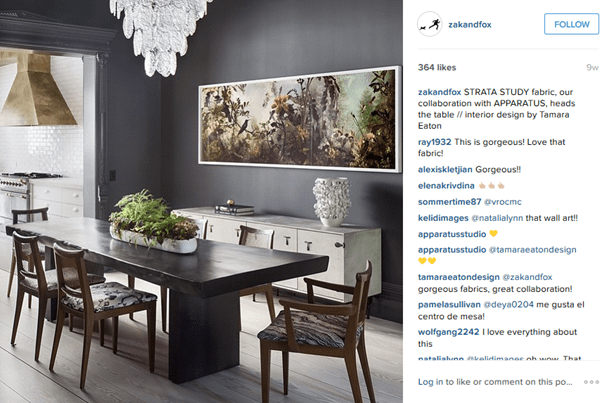 He posts pictures of colour palettes, paint swatches and inspiration boards for homes, as well as collections of ornaments. 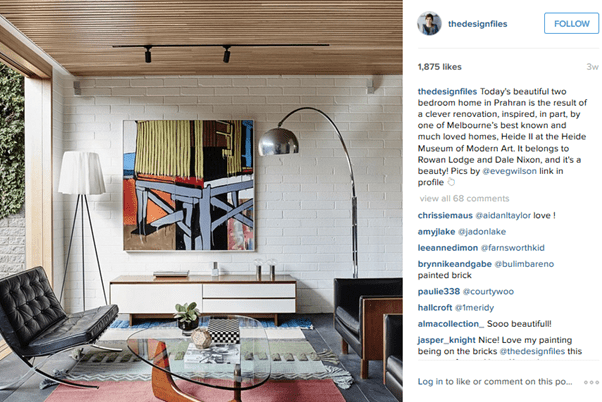 Hecker Guthrie was formed by Paul Hecker and Hamish Guthrie, where they both share images of their calm and balanced interiors. 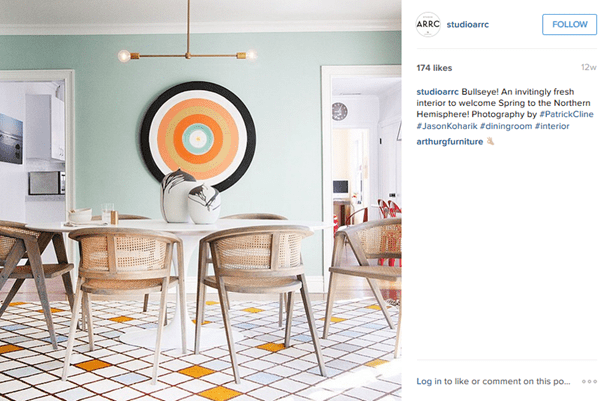 It also shows a glimpse into what inspires them, including Italian architecture, contemporary Australian art, and furniture or wall pieces of different colours, shapes and patterns for creating that unique look. Henriette Amlie Kalbekken loves minimalism and a muted colour palette – black, grey and white. For bathrooms, she uses black-framed mirrors, black tapware, white tiles and marble surfaces. She incorporates marble mac in her interior designs for a luxurious and high-class feel. She also showcases plants, glass objects and her great sense of fashion. 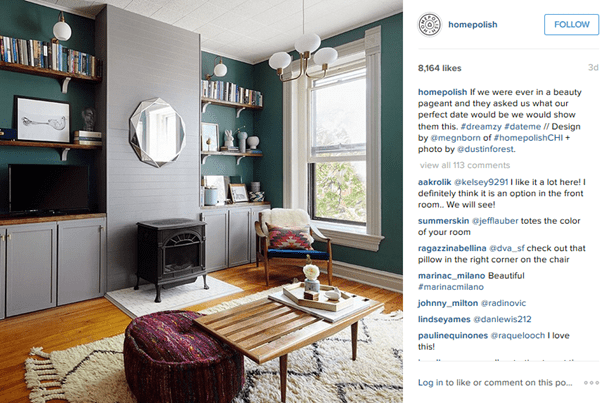 All pictures in Homepolish’s account are of their interior design projects. All the rooms are bright, with mostly white or light walls and floors and splashes of colour in furniture pieces. You can get different design ideas for the bedroom, living room and kitchen. 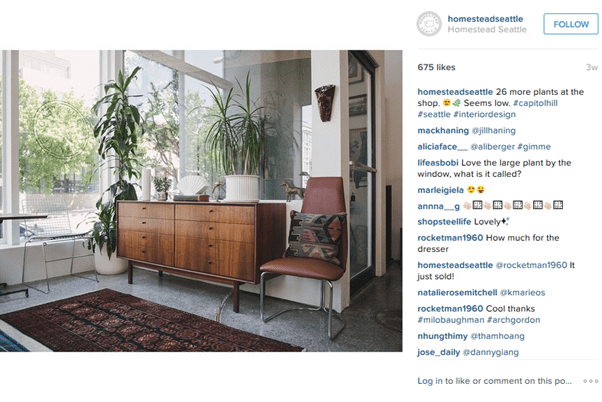 Homestead Seattle is all about finding and restoring vintage furniture and home goods. These include leather-tufted couches and mid-century drafting tables. 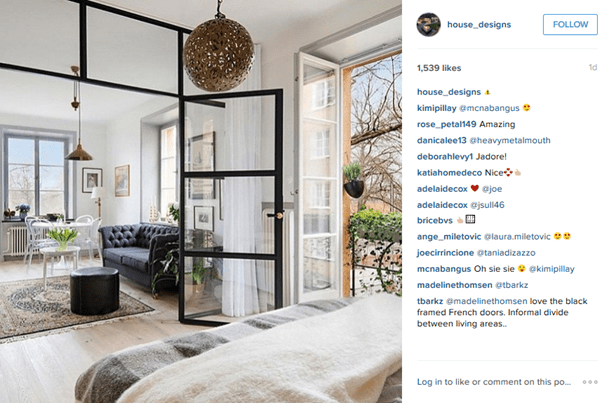 They also post images of beautiful interiors that make vintage feel contemporary again, and the rooms are bright with plants included in the design, bringing the outdoors indoors. House Designs presents all the different ways the main areas of the house, such as the living room, kitchen, bedroom, bathroom and the outdoors, can be designed. There’s a particular focus on muted colours, floor-to-ceiling windows that offer views of the outdoors or waterscapes, and glass dividers for privacy. Isabel Lopez-Quesada offers inspiration from around the world that is both elegant and sophisticated. The interiors of homes reflect a natural scheme, being mainly comprised of blues, greens and browns. She also shows the tiny details of her travels, including a great tile or fabric. If you want some pattern inspiration, follow this account. 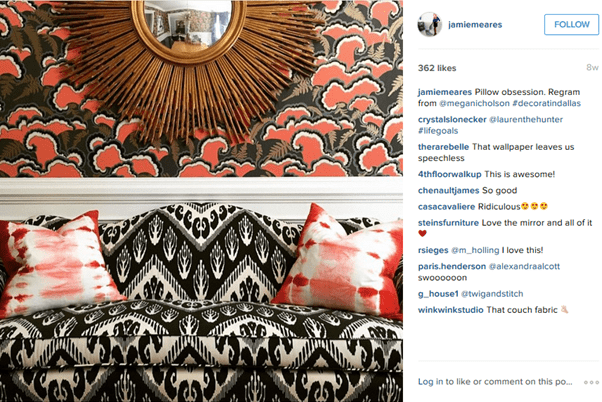 In Jamie Meares’ Instagram feed, you’ll find numerous inspirations in the form of bold colours, patterns, and smart ways to incorporate vintage pieces into a modern home. She also shares pics of printed fabrics that she sells at her shop, for pillows, chairs, footrests, and floors, as well as of her travels, architecture, friends, dogs, and cats. Jessica Helgerson switches from traditional to modern for an undefinable but stunning design style. This includes the use of either bold or muted colours and contemporary or vintage furniture. With clean lines and spacious interiors, they’re also ideal for big families and get-togethers. Other pics include those of nature, architecture and patterned rugs. 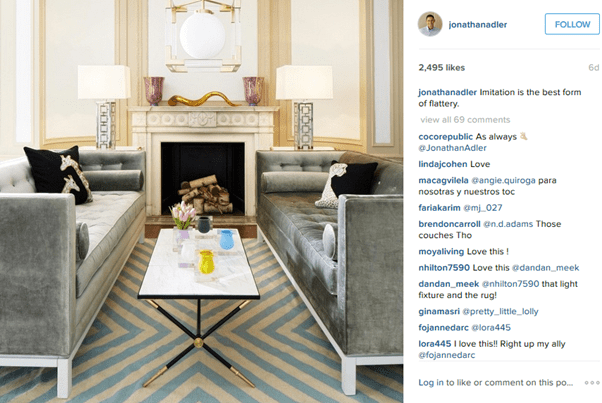 Jonathan Adler’s Instagram focuses on home décor, including full rooms, colour swatches, unique accessories, and individual furniture pieces. His interior design style is chic and glamorous and will make you feel like you’re living the high life. He also lets people know about what’s happening in his stores. 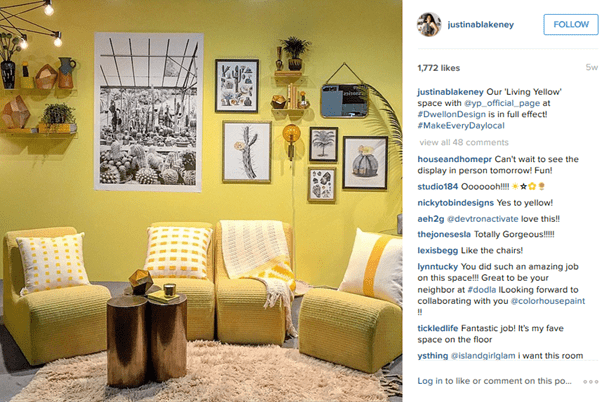 Justina Blakeney’s interior design reflects an American Southwest aesthetic, with warm vibrant colours, geometric patterns, rustic furnishings, flowers and leafy plants. She also puts up pictures of her artwork using a variety of flowers and foliage. Kate Arends’ white and airy interior design is not only comfortable, it’s also cool. You’ll be greeted with images of delicious food, flowers, nature, architecture, muted colours, and different shapes and patterns that you could use as inspiration for your own home designs, whether it’s for your living room, bedroom, kitchen or bathroom. Kelly Vittengl’s main focus when it comes to interior design is bohemian rugs. This works well in rooms with wooden floors and furniture, along with white walls and coverings. Plants can also be incorporated into the design. She also posts photos of the outdoors, nature, herself and her pet dog. 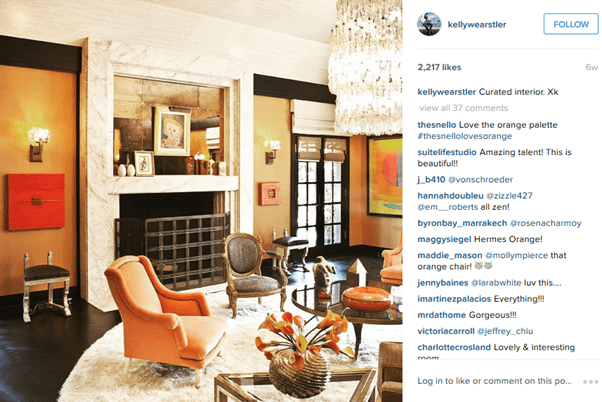 Kelly Wearstler posts images of bold interiors and home accessories that make a statement, as well as personal photos of her over-the-top fashion style, trips and dogs. Her interior design style includes lots of glimmer and gold, and beautiful sculptures and furniture. Her travels also offer inspiration for colours and patterns. Kelvin Ho’s Akin Creative is updated with his latest design projects for prestigious fashion and hospitality clients in Australia, such as Merivale and Bassike. 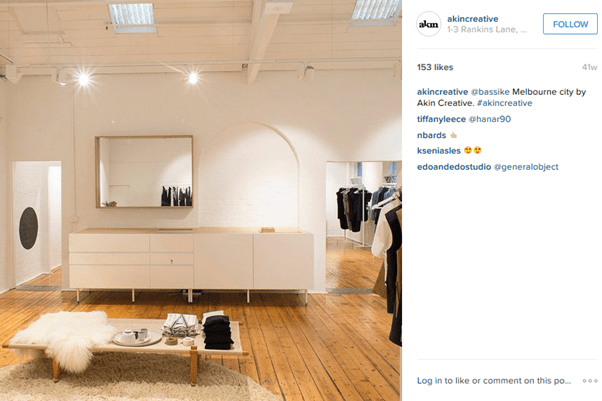 Akin’s interiors have clean lines and a simple design style with wood and white as the main features. Other images showcase various colours, lights, shapes, patterns, fabrics, nature, restaurants and glass walls. 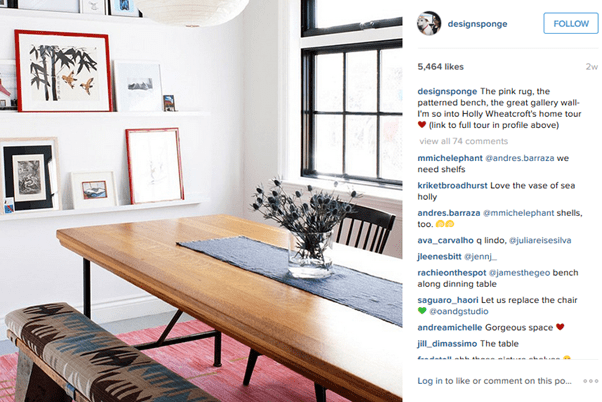 Lucy’s The Design Files is Australia’s most popular design blog that continues to offer inspiration from various designers. There’s plenty of décor, lights, colours and patterns. Other posts contain food, art, nature, textures, fabrics, houseware, and strange but cool architecture. 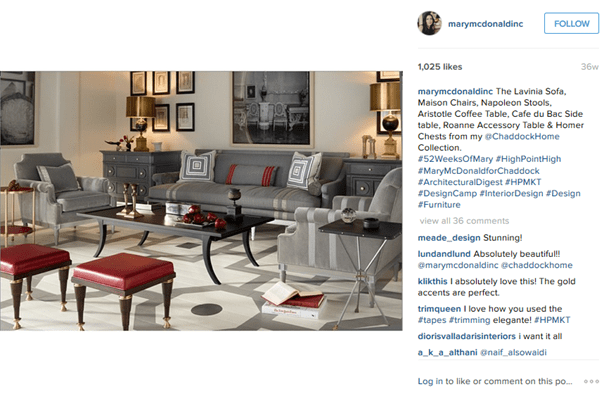 Mary McDonald’s interiors are timeless, with Chinoiserie accents, graphic patterns, and classic bold or muted décor. 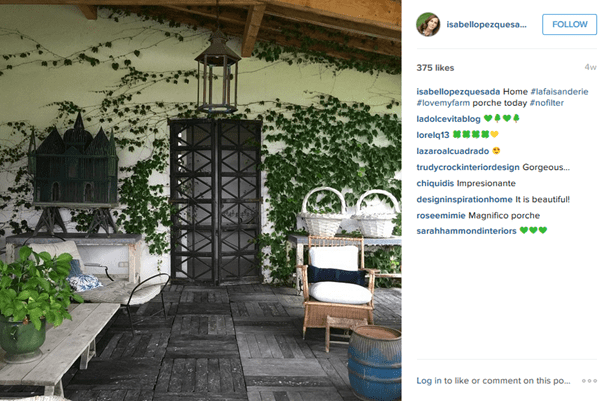 She also provides architectural, interior and furniture design ideas from her travels and other people’s homes. If you love a luxuriously sophisticated interior style, you can get plenty of inspiration from Mary’s range of projects. 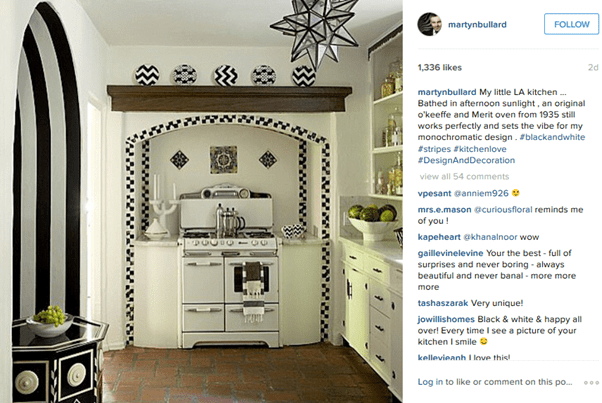 Martyn Bullard showcases images of his own stylish home, interior design projects and travels around the world, which include unique architecture, shapes and patterns. He experiments with different colours, mainly with combinations of two colours in a room that complement each other, such as black and white or orange and blue. Mat Sanders’ The Mat Finish displays his colourful and unique design style that even celebrities like Jessica Alba have fallen in love with. 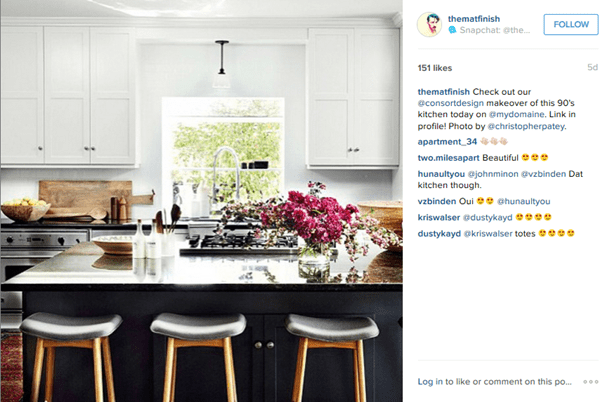 Aside from his interior design projects, Mat posts images of himself, his friends and his cute dog, as well as beautiful sceneries, flowers, restaurants, architecture, colour palettes and fabrics to truly inspire you. 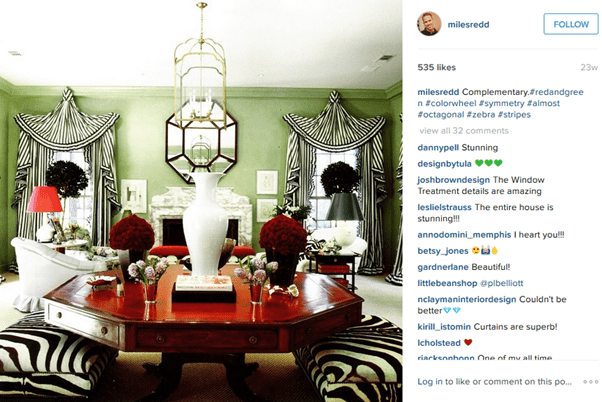 Miles Redd’s interior designs are glamorous but inviting, and are accompanied with cheeky commentary. He loves to play with different types of textures and patterns for different rooms and floors, as well as experiment with bold colours. He also shares personal photos, including those from his travels. Nick Olsen mixes bold colours, statement-making furnishings and unexpected textures for an elegant and cheerful aesthetic. His pictures come with spunky commentary and also show his natural ability to spot patterns and great colour combinations in everyday life. 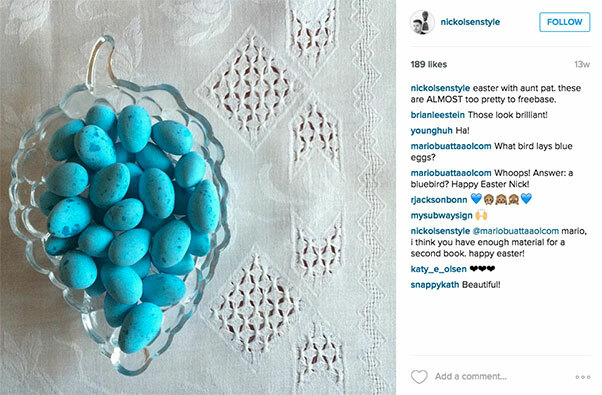 For inspiration on creating luxuriously exuberant interiors, Nick is the man to follow. 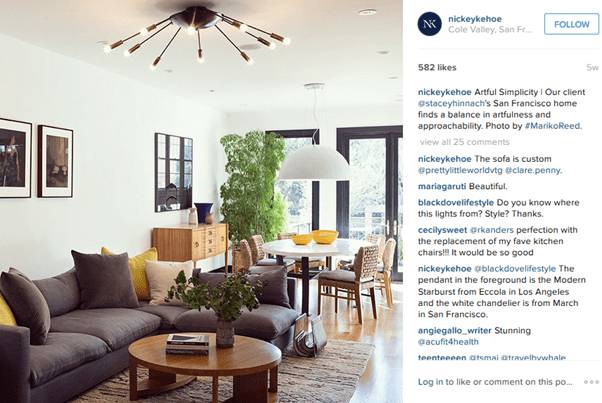 Nickey Kehoe was formed by Todd Nickey and Amy Kehoe, who both not only decorate homes but also run a shop that has elegant antiques, minimalist furniture and quirky objects – all featured on their Instagram. When decorating, they work with rugs and textiles and try to find ‘a balance in artfulness and approachability’. 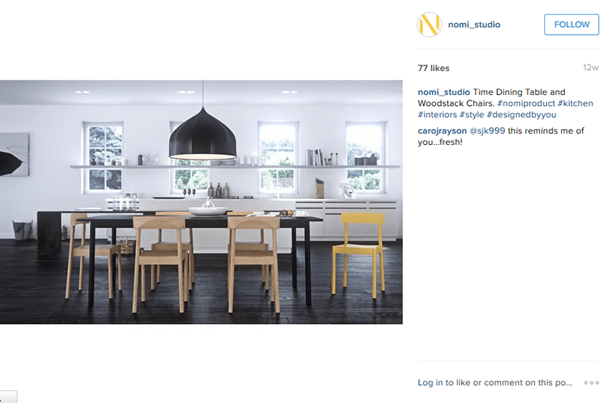 Nomi Studio, founded by Michael Grassi, Henry Gresson and Tomek Archer, is filled with a huge collection of customisable furniture options and an appreciation for primary colours. You’ll also find a vast array of shapes and patterns, the use of wood in interior design, and pictures of nature and beautiful architecture. Olivia Vianna’s In and Out Decor is a great reference for architecture, interior design and decoration for the indoors and outdoors. The main feature of her interior designs is the use of wooden floors, walls, ceilings and furniture. The addition of advanced technology and sleek surfaces also make for a good combo of traditional and modern styles that exude a high-class feel. Orlando Soria’s interior design style is one of a clean, minimal aesthetic with plants and flowers and pops of colour that create a cheerful and relaxing atmosphere. 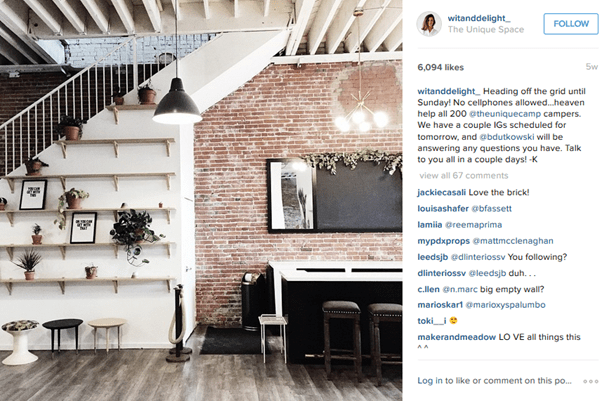 He also offers tips along with his pics, including how to decorate rooms and space-planning. 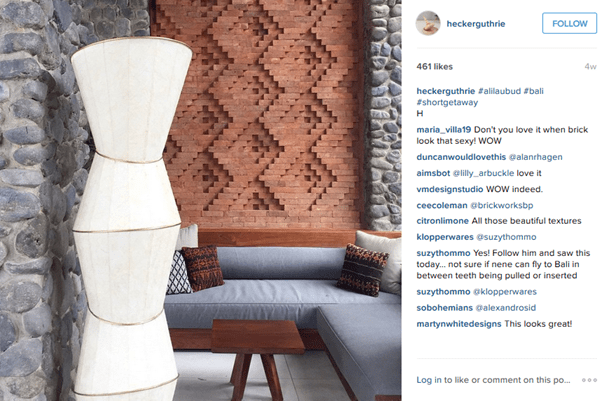 The rest of his feed is filled with images of the outdoors and building architecture. Regina Bonnici’s Bonni Whyte Interiors showcases everything you could possibly include when designing a home. 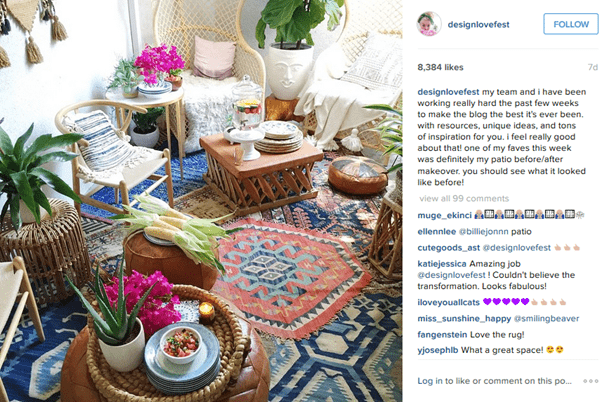 Patterns, textures, colours, unique furniture pieces, hanging lights, flowers, plants, artwork, and more are covered in this idea-filled feed. 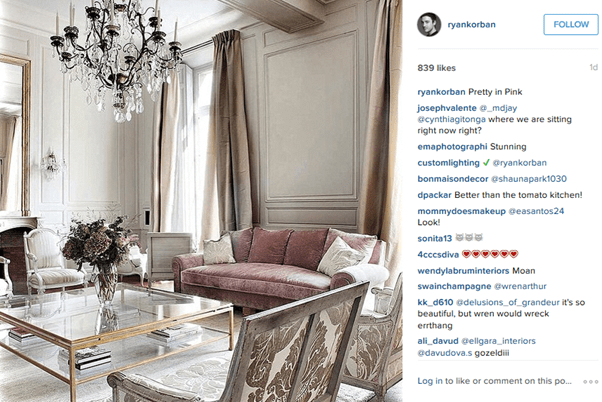 Ryan Korban showcases elegantly modern rooms in pale or pastel colours with gold accents, pretty flowers, and jaw-dropping architecture from his travels. The interiors of the rooms are spacious, classy, bright and airy, which give off a sense of luxury. 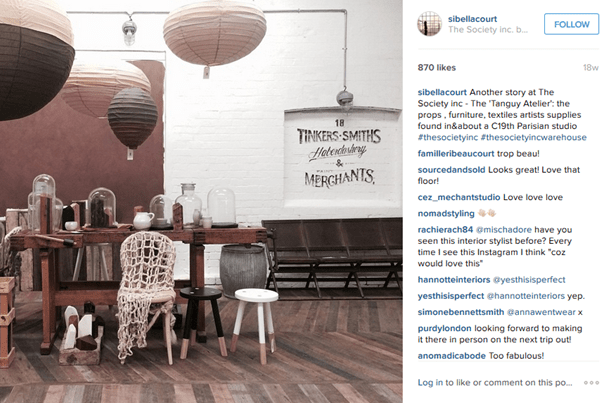 Sibella Court’s designs are rustic and full of charm. Her travel pictures portray old architecture, which are reflective of her design style. They also showcase moody vignettes with a combination of found objects and interior accessories. If you love the country or cottage-style homes, then Sibella will offer plenty of inspiration in those areas. Sophie Carr shares images of people, places and things that inspire and excite her, which reveals her eclectic yet contemporary taste. These include hanging wall pieces (mirrors, frames and art), hanging lights, unique architecture and outdoor living. Even the floors and walls have eye-catching designs and patterns. For truly standout contemporary interior design, Studio ARRC has everything you need. 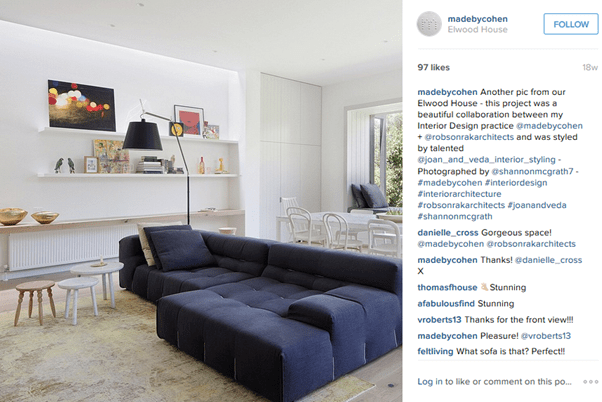 Susie Cohen is the person to follow if you think that a home’s structure – wall, ceiling and floor – is what makes it special, and that there should be little furniture. The interiors shown are simplistic yet inviting, and give off warmth and comfort. 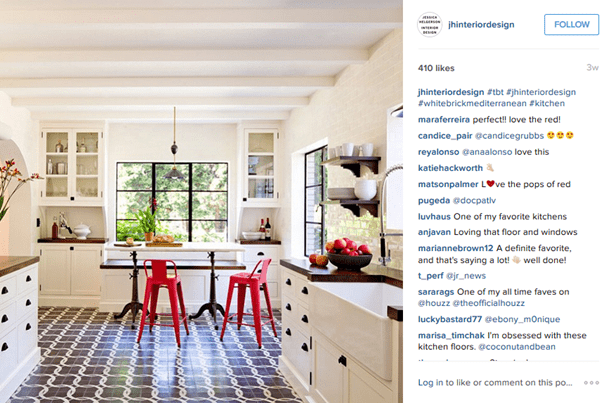 You can also get inspiration from the colourful and patterned furniture pieces, walls and floors. 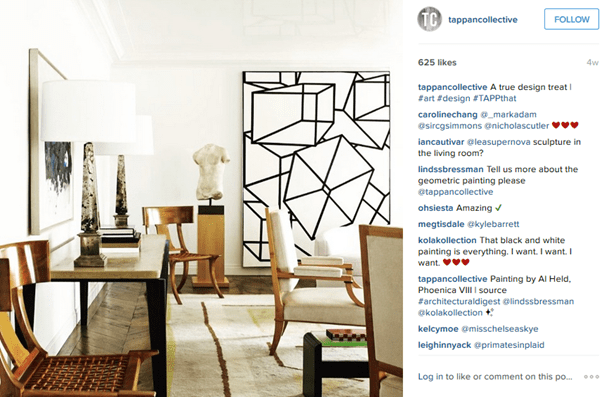 If you like wall art, radical interiors and natural colours, Tappan Collective is for you. With its mixing of the old with the new, the interior designs showcased have a classic, timeless appeal and present a glimpse into an enviable lifestyle. Zak Profera’s Instagram is focused on dark, moody and masculine interiors, with his self-designed prints for sofas, chairs and cushions. You can get inspiration from patterned fabrics, textures and muted colours, as well as consider incorporating flowers and plants in your design.